Browse our list of rentals by number of bedrooms to find the perfect size rental for you and your group. Options include rentals with 2-4 bedrooms, some of which can accommodate up to 12 guests! Find the right rental online today or call for assistance. Two bedroom rental cabins and mountainside homes perfect for your next vacation. Many of our rentals have amazing porches and fire pits. Enjoy breathtaking views of the surrounding landscape and stars, relax in the hot tub, or cozy up inside by a fireplace. With large windows and beautifully crafted interiors, these homey cabins are flooded with natural light. With options for pet owners, families, and groups, our two bedroom vacation rentals can sleep between 4-6 guests. Rentals that are tucked into the forest provide privacy and quiet, with access to nearby hiking trails. Other nearby attractions may include rafting, zip lining, The Great Smoky Mountain Railroad, Bryson City, Fontana Lake, and more! 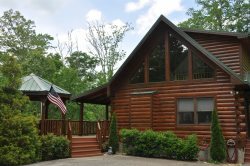 Our three bedroom rental cabins and homes offer the perfect getaway for those seeking a quiet mountain escape. With access to local hiking trails, fishing holes, rafting, and zip lining, each day holds endless opportunities for adventure. If you are looking for rest and relaxation, you will find our rentals are often equipped with hot tubs, large sun-soaked decks, and sweeping views of the surrounding landscape. With large windows and beautifully crafted interiors, these homey cabins are flooded with natural light. Our three bedroom vacation rentals offer a variety of amenities and are great for groups of 6-10. These unique rentals have impressive architecture and scenic lawns that will have you wishing you could stay longer. Other nearby attractions may include The Great Smoky Mountain Railroad, Bryson City, Casinos, Fontana Lake, and more! Our four bedroom rental cabins and homes offer the perfect getaway for those seeking a quiet mountain escape. If you are looking for rest and relaxation, you will find our rentals are often equipped with hot tubs, large sun-soaked decks, and sweeping views of the surrounding landscape. With access to local hiking trails, fishing holes, rafting, and zip lining, each day holds endless opportunities for adventure. With large windows and beautifully crafted interiors, these homey cabins are flooded with natural light. Our four bedroom vacation rentals offer a variety of amenities and are great for groups of 8-12. Well designed layouts with plenty of room keep guest comfortable. With great features like game rooms, fireplaces, and fully equipped kitchens, vacationing is easy. These unique rentals will have our guests wishing they could stay longer. Sunset Ridge - 4 Bedrooms , 4.5 Baths SPECTACULAR VIEW with Hot Tub and Shuffle Board In Media Room!